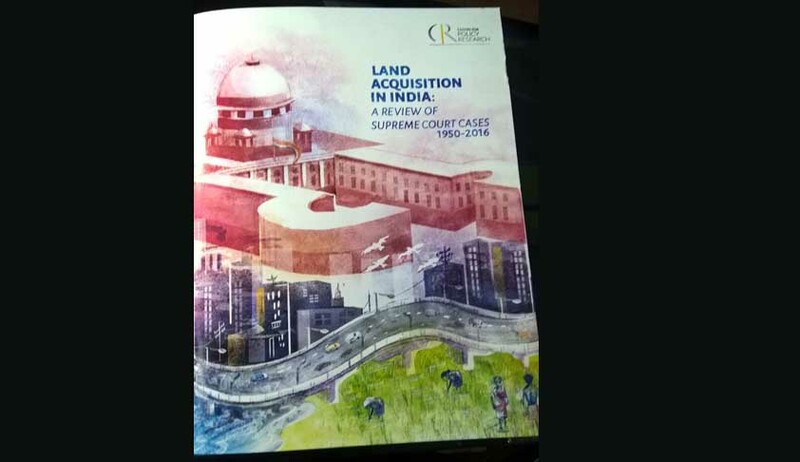 A report, brought out by the Centre for Policy Research, New Delhi, on “Land Acquisition in India: A Review of Supreme Court Cases: 1950-2016”, and released recently in New Delhi, predicts that the Court is likely to quash many more pending acquisitions under the Land Acquisition Act, and other acquisition laws. The report reveals that in an overwhelming 95 per cent of the cases, the Supreme Court invalidated the acquisition proceedings, in 2% of the cases, it remitted the matter back to the High Court and in a single case, it permitted the landowners to initiate proceedings in the appropriate forum. The report reviewed a total of 280 cases decided under the Right to Fair Compensation and Transparency in Land Acquisition, Rehabilitation and Resettlement Act, 2013 (LARR Act) over a period of three years from 2014 to 2016. About half of these cases were brought before the Court under its SLP jurisdiction, while almost all of the remaining half came before the Supreme Court as part of the Court’s civil appeals process. Only 14 per cent of these cases were bunch matters. All but eight cases were brought under section 24 of the LARR Act, which perhaps explains how quickly they have been finally decided by the Supreme Court. Ninety-seven per cent of these cases involved acquisitions made under the Land Acquisition Act, where the award of compensation was made five years prior to the commencement of the LARR Act. Almost 83 per cent of the challenges before the Supreme Court involved instances where no compensation had been paid to the land losers, two per cent of the cases involved instances where compensation had been paid to the land losers but the acquiring authority had not taken physical possession of the land. Approximately 11 per cent of the cases involved instances where neither compensation was paid, nor had the acquiring authority taken physical possession of the land. According to the report, that 200 of the 280 decided cases involved the Delhi Development Authority highlights the importance of the proximity factor in understanding the distribution of land acquisition litigation before the Supreme Court. “However, this also suggests that we may see an increasing volume of litigation from less proximate locations in the coming years”, the report cautions. Citing another study, the report reveals that state governments are diluting the provisions of the LARR Act by passing rules for implementation of the Act under section 109. “However, if the recent judgment of the Andhra Pradesh High Court is a sign of what to expect, courts will not look kindly on executive subversion of the rule of law embodied in the LARR Act”, the report warns. On the litigation before the Supreme Court over the last 66 years, the report finds that five States, namely, Haryana, Uttar Pradesh, Karnataka, Punjab, Tamil Nadu, and Delhi, account for almost three fourths (73 per cent) of all litigation. The report concludes that geographical and population size do not account for the extent of litigation, as shown by the presence of relatively small states at the top of the list. Access to Supreme Court, the report says, is facilitated not merely by proximity, but also “deep pockets”. Anecdotal evidence of the high fees charged by Supreme Court lawyers, especially “Senior Advocates” abounds, the report reveals. The report suggests that for a case to reach the Supreme Court, it would have been litigated for an average prior period of 15 years. The ability to sustain litigation over such a long period of time within the judicial system indicates deep pockets, the report explains. The report also reveals that the top 20 districts that account for almost half of all litigation (47 per cent ) are all highly urbanised districts or state capitals. NOIDA leads the pack, with twice as much litigation as the next two contenders, Cuddalore in Tamil Nadu and Mysore in Karnataka. The top 20 litigation districts also include Ahmedabad, Jaipur, Bangalore and Chennai. Major urban centres in Punjab, namely, Bathinda, Patiala, and Amritsar and commercial and industrial hubs like Indore and Nagpur also show high levels of litigation, the report finds. Obviously, land in peri urban areas that is acquired for the purposes of urbanisation and industrial development is of higher value than land in remote rural areas, and title holders of such land have greater incentive and ability to litigate, the report explains. The report, therefore, does not find it surprising that maximum conflicts over land acquisition are prevalent in those areas and districts, where there has been little or no litigation. Litigation, insofar as it signifies the ability to bring claims (through title-holdings) is a sign of legal empowerment as well as faith in and access to courts, the report observes. As the provisions of LARR Act extend the ability to bring claims to livelihood losers along with land title-holders, the report expects litigation to increase before the courts, if the government persists with non-compliance with the rule of law.